After spending more than 4 months in Ethiopia, I am now in in Nairobi, Kenya. I already accompanied George Orimba several times to his work. 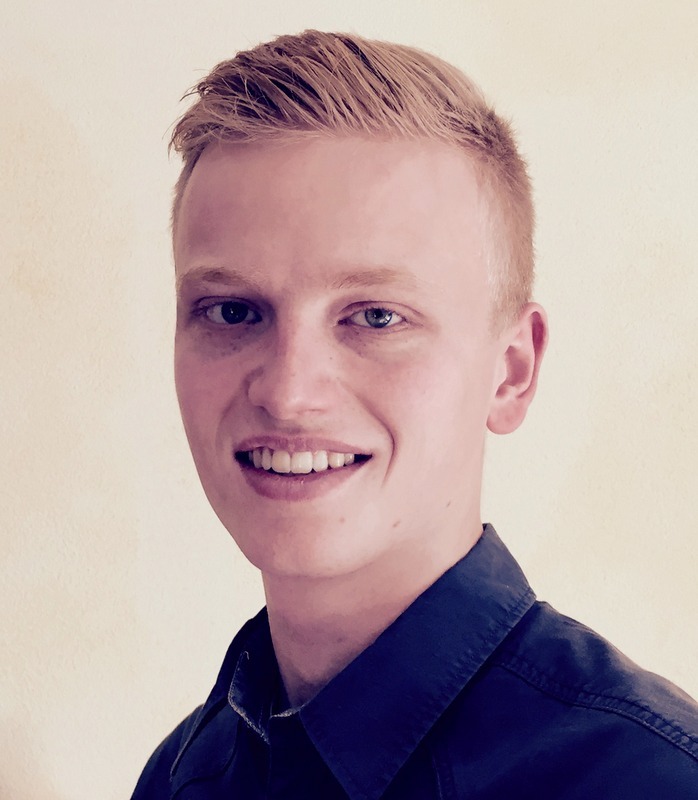 Next to supervising PBF and One-World-Network, he is also impressively committed doing social work in the classical sense. It’s very important, since in the slums of Nairobi problems with drugs and criminality are omnipresent. I believe that George is very qualified for social work, because he can make use of his experience he made while being a street child in Mathare. One time I could accompany George to Mathare. 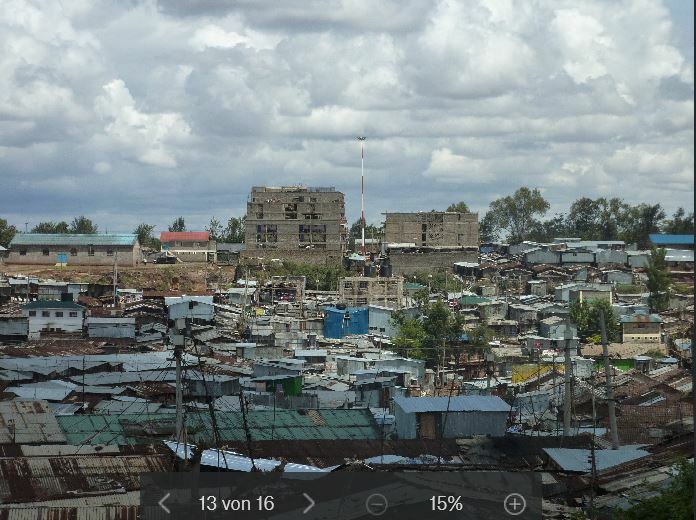 Mathare is Nairobi’s second largest slum. Exact figures don’t exist but it’s estimated that 400’000 to 470’000 people are living there. George showed me a school, where Dan Amolo (PBF-trustee in Germany) pays one of the three class rooms. 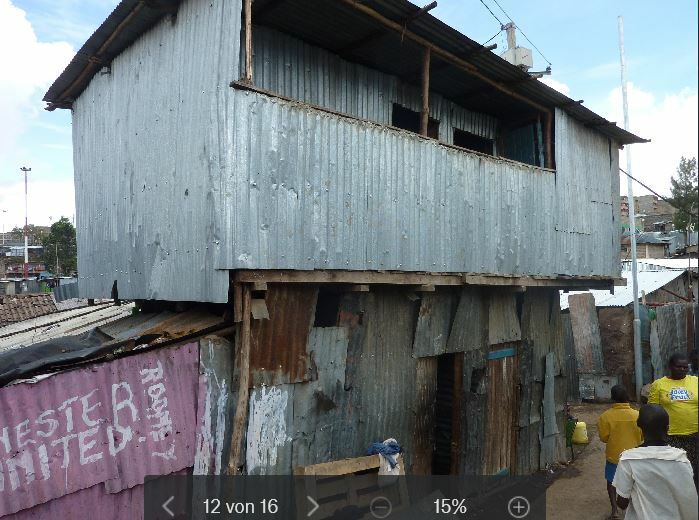 The school is located in Mathare and is, as well as all other buildings around, made from metal sheets. Despite the lack of space, about 75 children visit that school every day. 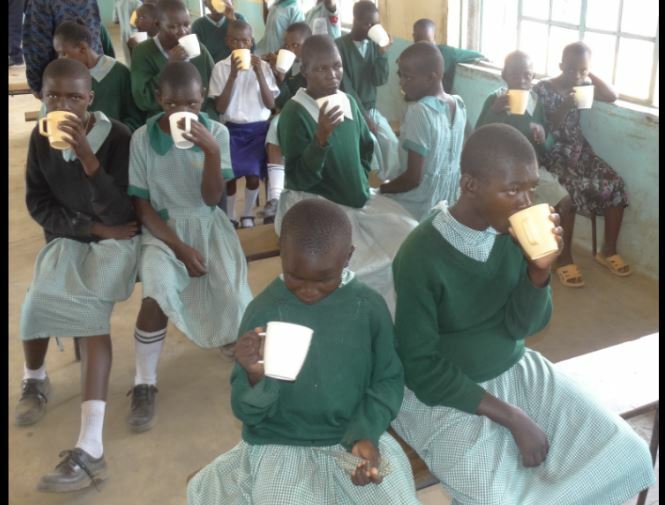 The students receive meals there. These are mainly financed by PBF. Without the meals many children couldn’t attend classes and would have to earn money on the streets to survive. A few months ago the 4th building, a staff room, burnt down. At the moment it’s under reconstruction. Furthermore George brought me to a rehabilitation centre of the Benedictines in Mathare. In this centre street children are taken from the streets and are prepared for attending school. The Benedictines pay the school fees of some of the children. Apart from a few public private schools, which offer very poor quality of education, the entire Kenyan school system is privatised. The school fees are so high, that many families can’t afford to send their children to school. Although this centre is not a PBF-project, it was very interesting to visit since Dan participated in establishing this project and George spend a time in his childhood in this centre. In addition we also visited a school for mentally challenged children, which is also financed and organised by the Benedictines. Dan and George often arrange volunteers from Germany, who teach there for several weeks or months. Old football jerseys from Germany and Switzerland are given to selected football teams in the slums of Nairobi. Uniform football motivates the youths to stay focused on the sport. Playing football keeps them away from criminality, drugs and violence. Thanks to team sport the youths also learn social skills, which often lack in the slums. There, everybody struggles to survive, so people often act with the mind of “survival of the fittest”. George also build up an own team in Mathare. On weekends and during vacation time he rents a pitch and organises training sessions and friendly games against other teams. 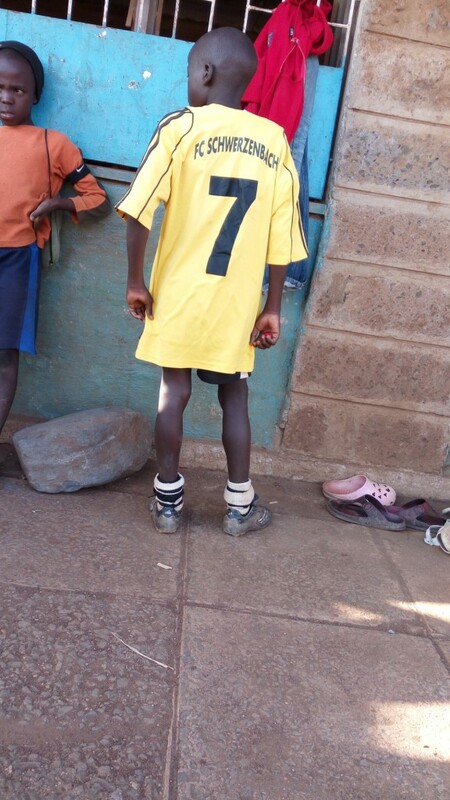 George also gave jerseys to the school in Mathare, which is supported by PBF. The men team but especially the women team of that school have been very successful last year. George also distributes reusable sanitary pads to girls and young women, also in the three mentioned institutions in Mathare. Of course he also explains them or their mothers how to use them. This project is also financed by PBF. George is very passionate with all his projects and he’s one of the people who impresses me the most among the people I met during my time in Africa. For the next day’s George and me will visit other PBF and One-World-Network projects in Nairobi and in areas close to Nairobi. Afterwards we are planning to go to a village called Mbuye, where many PBF-projects are located, among others a new water pump. Mbuye suffers, as well as many areas in East-Africa, of a heavy drought. Every day I experience how important and useful PBF and OWN also for Nairobi is.